Property Hunter is a leading real estate company in Qatar, offering honest and impartial advice with the highest standards of customer care. 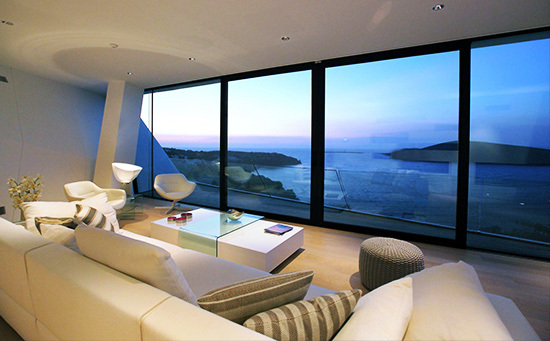 Property Hunter Luxury Real Estate specializes in the finest and the most luxurious lifestyle & real estate . Our services are delivered by people who have a deep understanding of the specialist property sectors in Qatar & will provide you with honest & professional advice. It is our pleasure to help our clients fulfill their real estate needs – whatever they are. What make our service different? Renting, selling, or buying property can be a complicated process but that is why expert people & professional services exist . We take the stress out of choosing whichever service you require for your property needs. 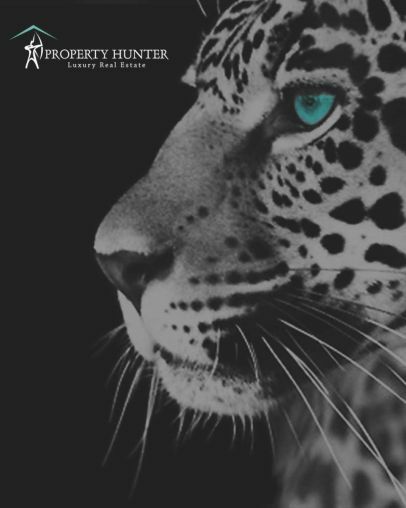 Dealing with property does not have to be hustle so let us help you hunting your perfect property . The Pearl Qatar is a unique and exceptional waterfront development located off the coast of West Bay in Doha. This mixed-use project is a man-made island covering nearly four million square meters and is overseen by master developer United Development Company. It is a popular visitor attraction by virtue of its chic elegance, inviting description as the ‘Arabian Riviera’. It is available as well for freehold ownership by foreign nationals according to law of Qatar. Lusail City is a self-contained and comprehensively planned project signifying Qatar’s progress on a grand scale. It is one of the most ambitious and ground-breaking concepts of Qatari Diar Real Estate Investment Company. Once finished Lusail will cover a total area of 38 square kilometers. The city will be home to 200,000 residents living on one of the four exclusive man made islands or in one of the mixed multi-purpose residential areas. The city also offers a broad range of entertainment venues ، numerous office buildings of various sizes and 22 hotels with different international star ratings, making it an element of attraction for investment in Qatar. Lusail City will be one of the most important and significant cities hosting the main stadium, teams, fans and audiences during the 2022 World Cup. 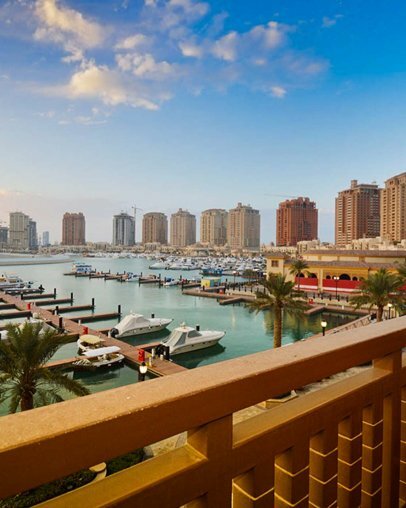 West Bay Lagoon one of the most upscale residential area in Doha located in immediate proximity to The Pearl, Katara Cultural Village, Lagoona Mall and the Doha Golf Club, all within five minutes drive. 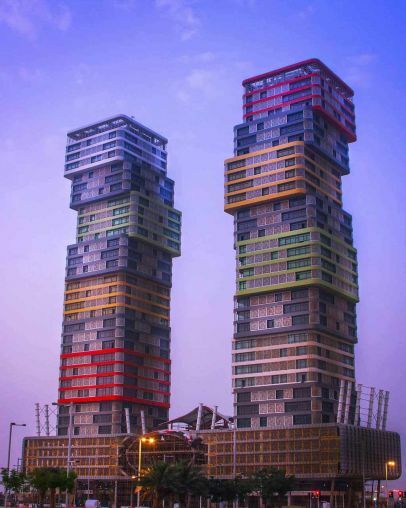 Zig Zag is representing a landmark in Doha’s residential skyscraper scenery and offers truly a different experience to its residents. Two distinctive twin towers with leasehold residential and commercial space. 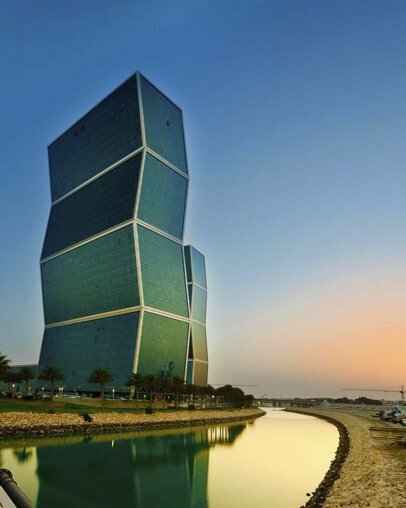 The iconic towers - nicknamed Zig Zag towers due to their unusual shape - stand above Lagoona Plaza, a luxury retail environment. The apartments are spacious with stunning far-reaching views across West Bay. West Bay lagoon & Zig Zag towers is one of the freehold zones in Qatar . Do have international properties ? We are specialist in the local market, we offer international service as well . What type of property do you offer ? We do have wide varieties of options for our clients for sale, for rent and for investing. Apartments, studios, penthouses, townhouses lands and plots, villas, Shops, office spaces, showrooms, hotel apartments and suits, commercial buildings , residential buildings, towers and off-plan projects. I would like to see the apartment , How it is done ? You may send an inquiry through our website, or reach us through our contact details, then our advisors will provide you with the consultation and arrange for the viewing . Do you facilitate relocation ? No, we do not offer relocation services. What is the most common areas to live in Doha ? Those are some of the most famous residential areas in Doha : AL Sadd , Al Nasser , Al Waab , Bin Mahmoud , Abu Hamour , Al Wakra , Al Gharrafa , AL Rayyan ,Old Airport , Al Mansoura , Bin Omran, West Bay , West Bay Lagoon ,The Pearl , Al Duhail and Lusail . What is the average rent and Sale prices in Qatar ? We may assist you with this and provide you with the suitable answers for your questions. Do you have properties for short term lease ? Yes we do provide short term lease service. Can I rent the property for more than one year ? The lease period and the duration of Tenancy Contract will be subject to approval from the landlord of the property . Can I pay the security deposit by cash ? Usually any issues related the payment will be subject to approval from the landlord of the property . Do provide cleaning service before moving in the property ? We do not provide this kind of service , however we do assist you and provide the advise . The landlords sometimes are willing to do so but still subject to approval. Do provide repairs and maintenance ? We do not provide this kind of service , however we do assist you and provide the advise . The landlords sometimes are willing to do so but still subject to approval and depends on the terms and conditions of the agreement. Do I have to provide the contract or related forms ? 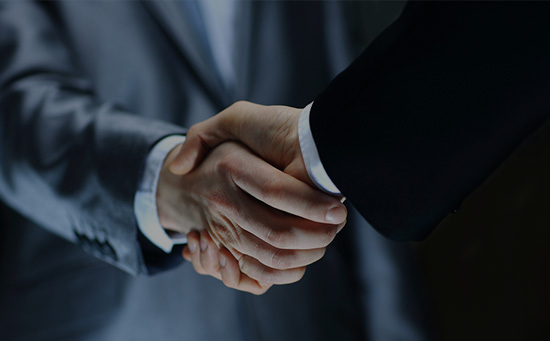 We take care of any paper works and related transactions through our contract and account department, and we do provide our clients with up-to-date legally binding documents . However we may sometimes ask for additional documents and requirements which should be done by yourself. I am still new to Doha and do not have Qatari ID and RP , can I rent property ? Yes You can rent property . You will need to provide a copy of your passport and approval from your sponsor and /or Letter from your work place. What documents do I need to provide to rent property ? You might need to provide additional documents according to the conditions . Will I be able to terminate the tenancy agreement ? It depends on the terms & conditions of your tenancy agreement . What kind of property do you have for rent ? We do have wide varieties of options for the property seekers who are looking to rent . Do you charge any fees ? Yes we do charge agency fee depends on the type of service. I am foreigner, can I buy property in Doha ? Non-Qataris can purchase freehold and leasehold properties in designated areas of Qatar. You can currently purchase within two Freehold areas (The Pearl Qatar, Zig zag Towers & West bay Lagoon) in addition to Barwa Al Khor . Musheireb , Frij Abdul Aziz , Doha Jadeed , Ghanem Al Qadeem , Al Rifa Al Hitmi , Al Salata , Bin Mahmoud , Bin Mahmoud , Rawdat Al Khail , Al Mansoura - Bin Dirham , Umm Ghuwailina , Al Khulaifat , Al Sadd , New Mirqab - Al Nasser , Doha International airport , Al Dafna & Onaiza & Al Qitar , Lusail, Al Kharaij and Jebel Thiya . Freehold zone – an area where foreigners can buy and own property for ever. Leaeshold zone : properties that can be leased by them for 99 years. Upon expiration, the lease can be renewed or the land and structure go back to the original owner. Do I have to provide the purchase agreement related forms ? We take care of any paper works and related transactions as much as we can through our contract and account department, and we do provide our clients with up-to-date legally binding documents . However we may sometimes ask for additional documents and requirements which should be done by yourself. What costs should I bear in mind when buying a new home? We can provide a full list of fees and charges applicable to property purchase in Qatar, which generally include the price of your new home, ministry fees and other ancillary charges. How long it will take to receive my property ? Why should I buy in Qatar? We simply believe 'why rent if you can buy'. Your rental expenses become someone else's savings - why not invest the money yourself? Choosing to own property in Qatar is a good investment vehicle, whether you to opt to live in the property yourself or rent it out. There have been many reports of expected increases in property prices in Qatar due to the FIFA 2022 World CupTM and the subsequent necessary developments to local infrastructure. While these reports may show varying facts and figures, what is evident is that people are feeling optimistic about the property market here. Sale prices and rental income are showing stability and growth within our specialized areas of Doha, assuring you of a positive return on your investment. Where can I buy in Qatar if I am an expat? I heard I can get a Residence Permit when I buy a property - is that true? Yes you can apply for a residence permit when you are a homeowner. This is not a work permit but will allow you to live in the country without an employer sponsoring you. We have assisted several of our clients in this process; we can provide you with a list of requirements and fees upon request. I first time buyer, what should I do before looking for property ? Yes, you can apply to one of the banks here in Qatar. Property Hunter does not provide financial services, however can recommend banks and other financial institutions to offer advice where appropriate. What kind of property do you have for sale? We do have wide varieties of options for our clients for sale and for investments . How long it will take to sell my property ? The answer to this question is not fixed an depends on my factors ,But more likely, how long it takes to sell a house depends on the following factors, location, local market, condition and features, asking price, restate agency hired, and season. The best time to sell a home will be variable depends on many factors and circumstances ( location and community, price, season, status of the property , landlord’s requirements ). How is the market right now ? We as expert in the local market will share with you the status of the real estate market and provide the proper advice to achieve the target. The value of the property can be variable according to many factors like the location, neighbourhood , status of the property , size (sq.m), features of the home, floorplan, and other related factors. Before pricing and advise about the value of any property , we do in-depth evaluation and market analysis in addition to the professional advice from our experienced advisors. Do I have to be present for any scheduled viewing to my apartment ? No, You do not have to, we take care of everything on behalf of you. How to prepare my home for selling or renting ? In order to get the best deal for your property, you need to take some time to stage it so that it looks in a down market and get the best result. We assist our landlords about the common desirable features and requirements to get higher chance and win picky buyers and tenants over. Cleaning ,panting your home, repairing any defects and making sure any appliances are working and are in good condition will improve the performance for sure. We advise sellers also to check their liabilities, financial obligations and receivables taxes to finalize any pending, in order to facilitate the selling process and make it smooth without wasting time. Should I include appliances or leave them as negotiable? The decision whether to include appliances is ultimately up to the seller. Another thing to be considered , the appliances do not add much value to a home. We do have our photographers ,marketing department and they are responsible to market your property and offer it in a proper way through our channels to guarantee it has high exposure in the market. How do I know about the feedback and the leads received ? One of our priorities is to keep the landlords up to dated with the performance of their properties in accordance to the market status . You should expect to hear from your advisor at least once a week when selling or renting your home. Do I have to provide the contract or related forms and documents ? How long it will take to rent my property ?